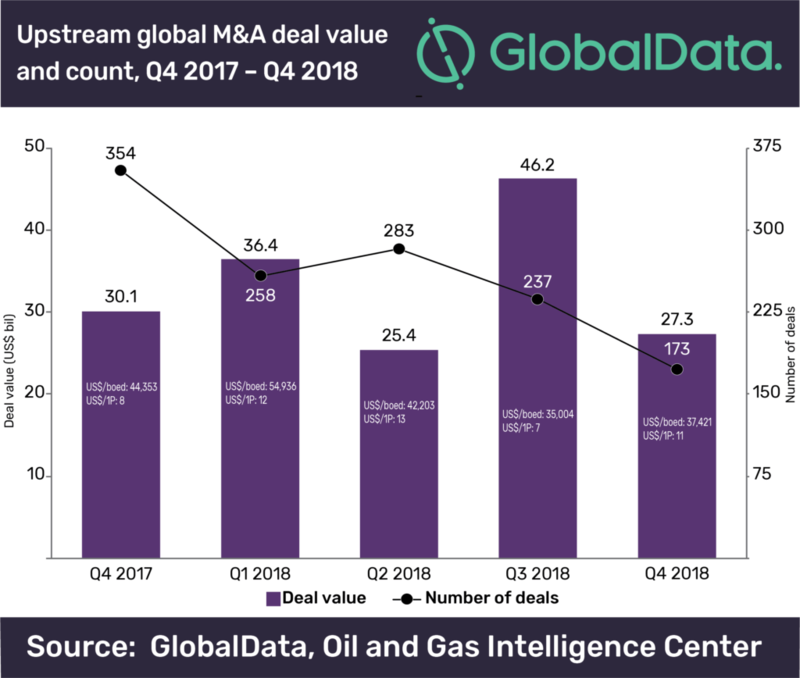 A total of 305 deals with a combined value of US$47.9bn were registered in the upstream oil and gas industry in Q4 2018, according to GlobalData, a leading data and analytics company. Of the total value, US$27.3bn was registered in mergers and acquisitions (M&A) in Q4 2018, representing a significant decrease of 41% from the US$46.2bn in M&A deals announced in Q3 2018. 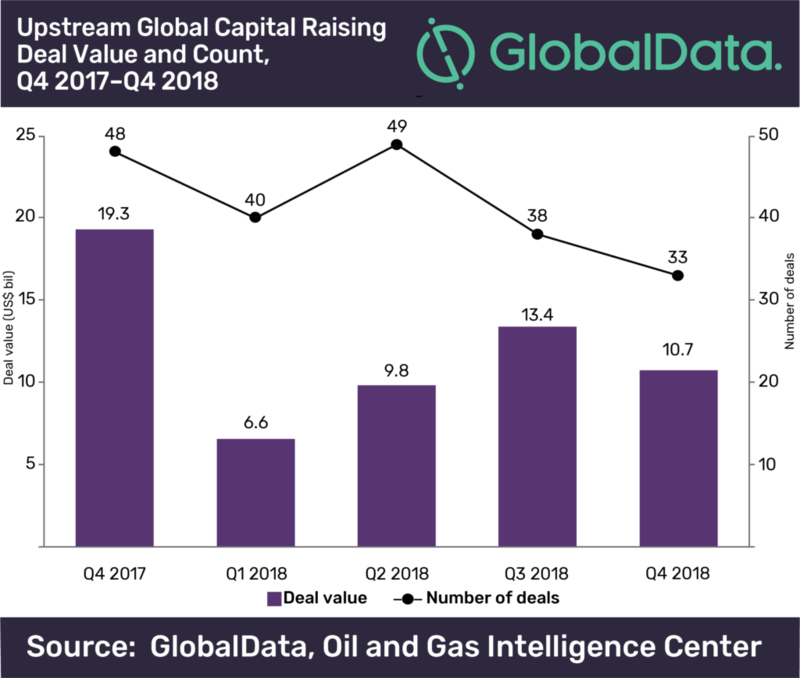 On the capital raising front, a total value of US$20.6bn in capital raising was announced in the upstream sector in Q4 2018, a decrease of 43% from the US$36bn in capital raising announced in the previous quarter. The company’s latest report: ‘Quarterly Upstream M&A and Capital Raising Deals Review – Q4 2018’ states that a total of 120 M&A deals, with a combined value of US$7.9bn, were recorded in the conventional segment, and 53 deals, with a combined value of US$19.4bn, were recorded in the unconventional segment, in the quarter. Of the total M&A deals, 104 deals, with a combined value of US$14.4bn, were domestic acquisitions and the remaining 69, with a combined value of US$12.9bn, were cross-border transactions. A quarter-on-quarter comparison shows a substantial decrease in domestic transaction values in Q4 2018, compared to US$39.1bn in Q3 2018. However, cross-border transaction values increased substantially by 82% in Q4 2018 compared to US$7.1bn in Q3 2018. Capital raising, through debt offerings, witnessed a decrease of 48% in deal value, recording US$16.7bn in Q4 2018, compared with US$31.9bn in Q3 2018. The number of debt offering deals also decreased by 48% from 54 in Q3 2018 to 28 deals in Q4 2018. Capital raising, through equity offerings, registered a decrease of 11% in the number of deals and an increase of 33% in deal value with 93 deals, of a combined value of US$3.2bn, in Q4 2018, compared with 105 deals, of a combined value of US$2.4bn, in the previous quarter. 11 private equity/venture capital deals, with a combined value of US$708.3m, were recorded in the upstream industry in Q4 2018, compared with 14 deals, with a combined value of US$1.7bn, in Q3 2018.